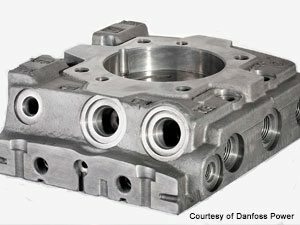 Meeting quality standards for finished surfaces on complex components can be a challenge for the manufacturing industry, especially when production time is a critical factor. 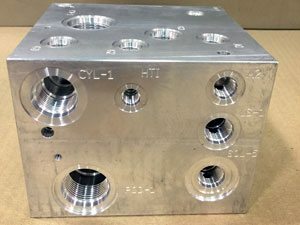 The TEM finishing process provided by Extrude Hone® achieves complete deburring and deflashing results in a highly efficient manner. The TEM process utilizes the combustion of methane gas within a pressurized chamber to remove burrs, flashings or hidden contaminants from machined components through an oxidation reaction. The fuel to oxygen ratio and pressurization level is determined based upon the heat transfer rate of component material, burr or flashing thickness, and batch size. A spark ignition system creates the heat necessary to ignite the compressed gases. This results in a heat wave reaching 6,000°F for just a few milliseconds. Because the burrs or flashings are much smaller than the component, they reach their auto-ignition point instantly and are oxidized in the oxygen-rich chamber long before the component can be harmed. The mass of the component acts as a heat sink during the oxidation process. The gases surround all burrs and flashings, allowing for their complete removal regardless of the location on the component. This results in a component free of any loose particles. The removed burrs form an oxide powder that is redistributed across the component surface as a loosely attached dry film that is not chemically bonded. Typically, follow-on heat treatments are used to remove this oxide or they are removed in a follow-on plating processes. Alternatively, neutral cleaning solutions are available to remove the oxides in an immersion cleaning process. Each component to be deburred or deflashed is held loose in a special-purpose basket (non-critical parts) or fixed into a plate and then placed into the combustion chamber for processing. Deflashing: Removal of zinc, zamac, or aluminum die cast mold flashings. Decontamination: Removal of machining particles trapped in hidden areas. It is critical to both quality and production efficiency that the process of removing burrs, flashings or contaminants be effective. Our TEM process has a proven track record of meeting this challenge. Deburring effectiveness. Burrs, flashings and loose particles are eliminated, regardless of their location on the component. Process efficiency. Compared to traditional mechanical and abrasive methods, there is no media that can become trapped in internal areas or contaminate the surface. Ease of use. Compared to water jet, TEM is not a line-of-sight process requiring targeted programming of media. With TEM, the gas envelops every area of the component simultaneously. Blockage elimination. Compared to water jet, mechanical and abrasive methods TEM is a non-contact process therefore burrs and flashings cannot be folded or pushed onto the component. Abrasion elimination. Compared to manual and mechanical methods, no secondary burrs are produced and there is no risk of scratching critical areas. Machining simplicity. Only simple baskets and workpiece holding fixtures are required. Extremely high production rates. Up to hundreds of parts in a 30- to 60-second cycle time is typical and 24/7 operations are achievable. Cost-effectiveness. TEM processing cost is less than a fraction of a cent for gas and electricity usage per component, resulting in operating costs that are among the lowest in the finishing industry. Quality and repeatability. Superior process stability combined with good process control ensures precision, constant quality and the highest repeatability. Uniform results. Our tooling assures uniform energy distribution and protects surfaces while undergoing processing. Customized tooling. Our plate and pin fixtures are corrosion resistant and custom designed to suit specific application. Ease of automation. Our tooling provides for ease of loading and unloading components and maintenance of workpiece orientation. Enhanced component performance. Many customers report a reduction in component performance failures and warranty claims, leading to a higher level of customer satisfaction.